What Acuity Scheduling Triggers and Actions are Supported? Appointment Rescheduled - Triggers when an appointment in Acuity gets rescheduled. Appointment Canceled - Triggers when an appointment is canceled. New Product Order - Triggers when a new order is completed. New Appointment - Triggers when a new appointment is scheduled. Appointment Start - Triggers a specified time before an appointment starts. Add Package Code - Adds a new package code. Add Coupon Code - Adds a new coupon code. Add Blocked Off Time - Block off a new range of time on your schedule. Find Appointment by ID - Finds an existing appointment by appointment ID. Find Appointments by Client Info - Find existing appointments from client info. Admin/owner permissions: Administrator permissions are needed to unlock full functionality. The first thing you'll need to do to get started with hooking up Acuity Scheduling with Zapier and hundreds of other services is to add your Acuity Scheduling Account to Zapier. Click to add an Acuity Scheduling account in your Zap. You'll then be directed to Acuity where you can authorize your account to be connected to Zapier. 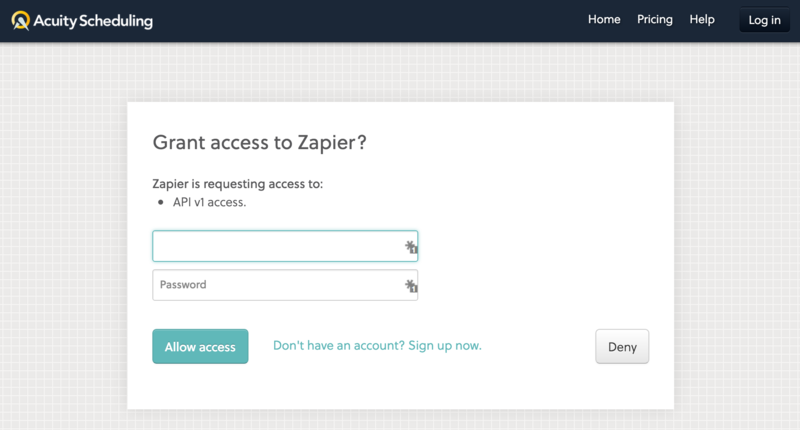 Once you click the "Allow Access" button, you will be redirected back to Zapier, where you'll see that your account was successfully connected. This trigger can only fire once per appointment. So, if your Zap fires, and then your appointment gets rescheduled, it won't fire again for the new appointment time. To check if an appointment has been rescheduled, click on that appointment in your Acuity calendar, and "view changes & notifications sent" from within the appointment details.